Great way to be different from the rest of the competition by being 100% eco-friendly. I will definitely be spreading the word on you guys. 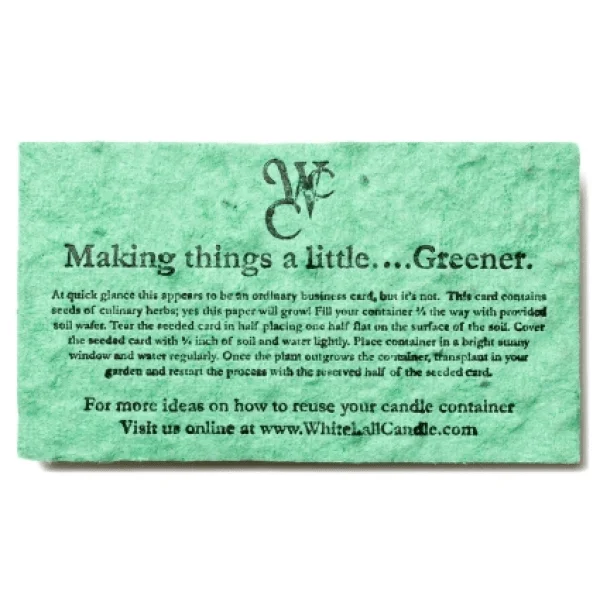 Wide variety of options when personalizing these seed paper business cards. I absolutely love it. These business cards are the best. My company orders these every year to promote our eco-friendly trend! Really glad all your products are eco-friendly. I wide variety of options when personalizing these seed paper business cards. These business cards are the best! My company always orders these to promote our eco-friendly trend! We bought this paper to promote our company brand and put flyers around town. 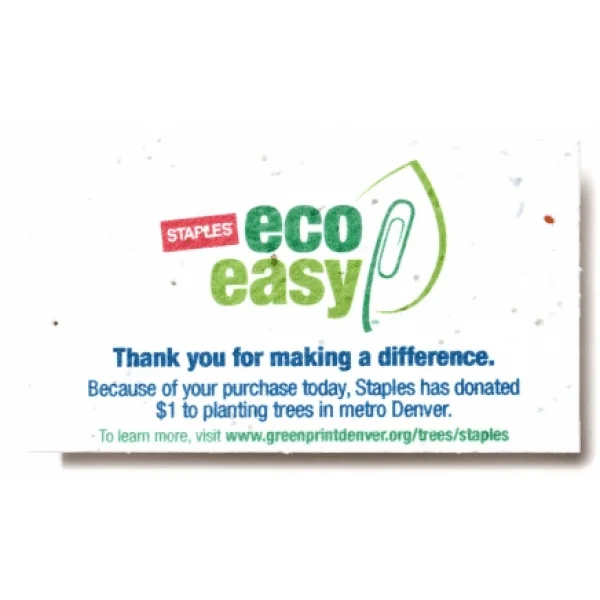 I LOVE this paper, because we can promote our company knowing we aren't hurting the environment. Great way to be different from the rest of the competition to get your name out there. Sent these to all our clients all over the world for an upcoming event. My hope was they would be planted, and a piece of us would be in a bunch of different countries. Pretty neat premise with these business cards. You can give them out and explain to people that they can be planted. A memorable way to gain attention. Our company needed to format business cards for all our agents. When we came across the idea of seed paper cards we couldn't pass it up. I got my order of 10,000 seed paper business. Couldn't be happier with the finished product. Our firm loved the idea behind the seed paper business cards. Great way to justify business needs and personal motivations as far as being earth-friendly. I support any quality product that is made out of 100% recycled material. I like that the dyes used are all natural. Truly 100% eco-friendly. Nice that there are seed options, so you can have a lot of variety when creating your business cards. A very diverse color palette to choose from. I wanted to create a unique business card, and this was exactly what I found in working with Custom Earth Promos. 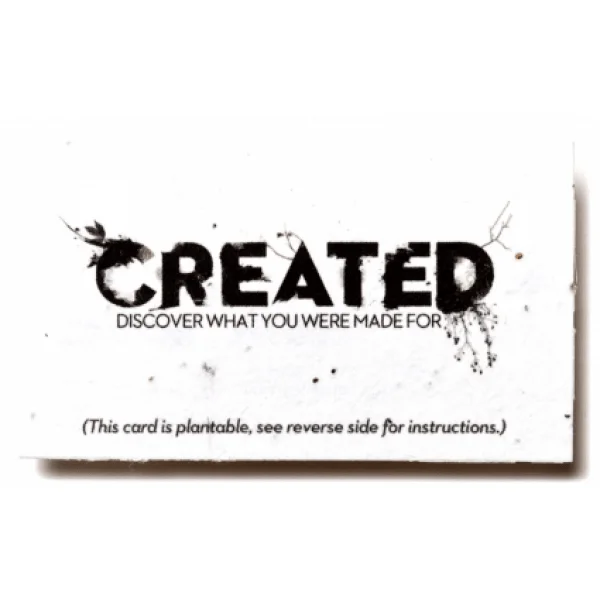 Put your best foot forward with Seed Paper Business Cards from Custom Earth Promos. Give connections, prospects, and potential clients the gift of life along with your contact information, event invitation or eco-friendly initiative to ensure the lasting power of your message. 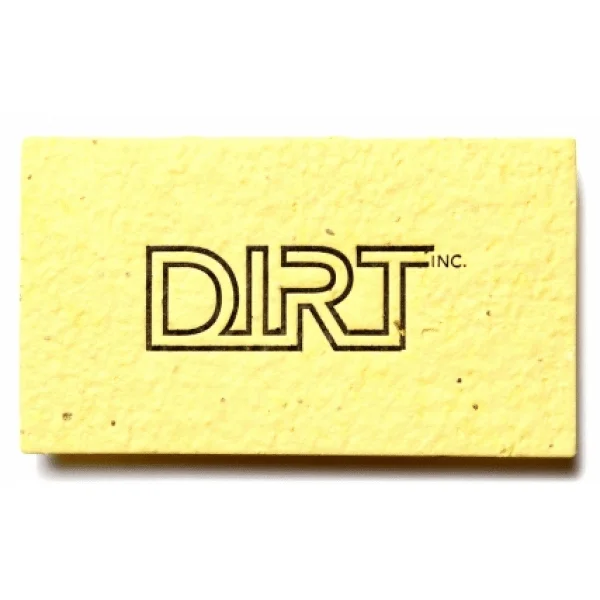 Our seed paper business cards promise to embody your brand or professional self with integrity and style while maintaining the aesthetic attributes that your audience associates with you and/or your brand. Eco-friendly business cards are a great way to establish yourself as environmentally aware and invested, which has evolved to be the single most important factor for today's consumers. 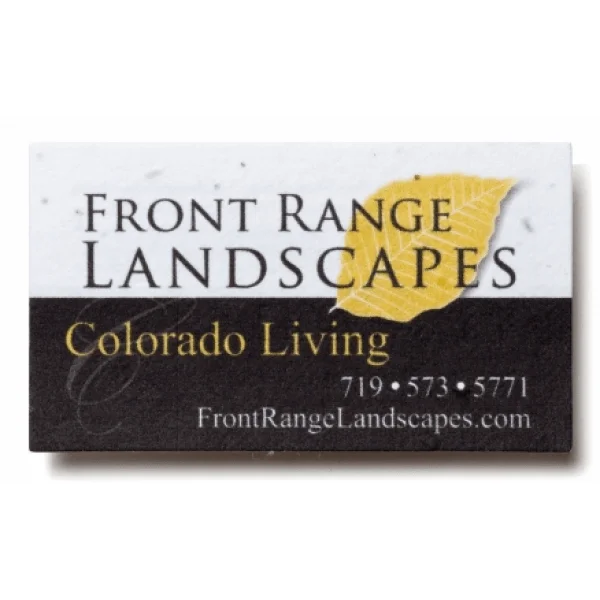 Render your design to appear horizontally or vertically on the 3.5" x 2" card. These adaptable cards make excellent eco-friendly business cards, while also offering a budget-friendly alternative to fancy event invitations, thank you cards, RSVP's or networking event handouts. Orders come with one side of full-color, full bleed imprinting and can be printed on the second side for a slight upcharge. Customize the design alongside one of our in-house experts to for optimized visibility. Once the design blueprint has been approved, we can have your order delivered in just 5-7 business days. "Going green" grows increasingly attractive as a business strategy. Unprecedented statistics reflect the staggering power of sustainability over consumer purchases, with over 55% of the global population willing to pay a premium for environmentally responsible products and services. As consumers are growing more educated of a growing global population that is competing for a limited amount of finite natural resources, they are adapting their personal behaviors to reduce waste and conserve resources. They expect the same environmentally ethical behavior from the businesses they purchase goods or services from and are more than willing to take their patronage elsewhere in their absence. Sustainable business practices have become vital to the very survival of brands in virtually every industry. Eco-friendly businesses are receiving significantly higher levels of consumer interest. In addition to greater consumer interest and the power to affect purchasing decisions, eco-conscious strategies can also lower operating cost, increase profitability and create qualifications for supportive government policy. With "green" products and practices being in demand among customers, highly sought after by shareholders and more commonly required by governments, brands who fail to establish themselves as environmentally aware are putting themselves at great risk to be outshined by their proactive competitors. Take action to secure the future success of your business. Implement sustainable production strategies, invest in green products and consider ways solar energy may lower your production costs. 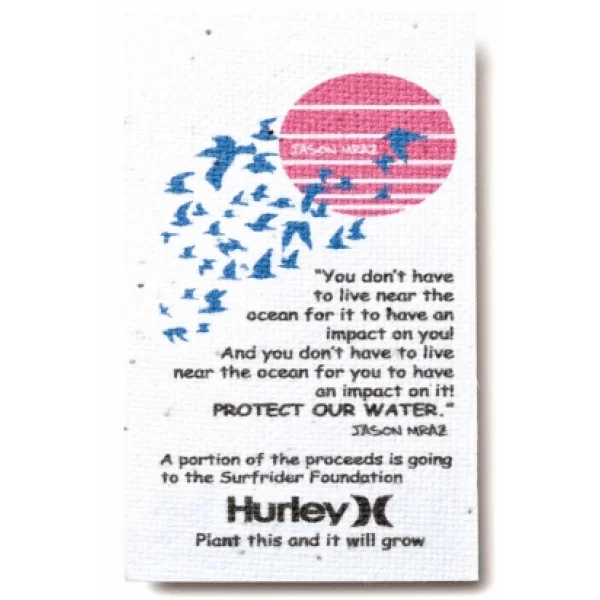 Promote the admirable actions you've taken to benefit the future of our planet and prompt your customers to do the same starting with Seed Paper Business Cards. At Custom Earth Promos, we take great pride in providing top-of-the-line eco-friendly promotional items with custom designs. 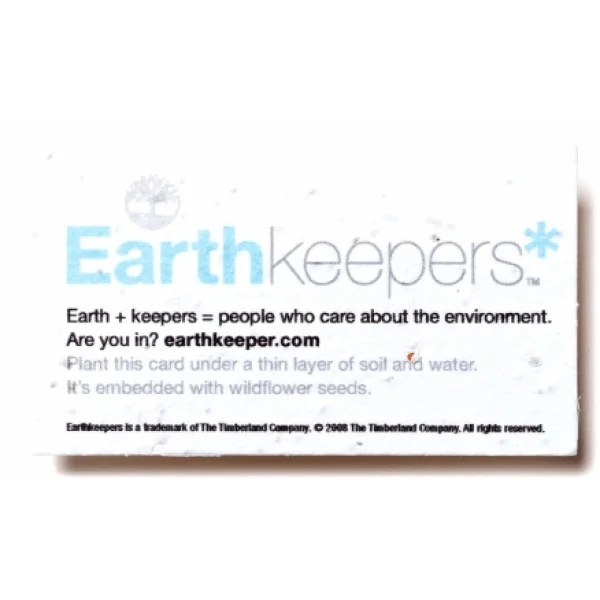 Our Seed Paper Business Cards are made from 100% post-consumer recycled materials and embedded with our top performing wildflower seeds. Seed paper is manufactured with solar power in the USA in a carefully monitored process that ensures the highest quality seed paper in the industry with the highest germination rates. Only USDA-approved, non-GMO seeds are used. All 21 seed paper color options are created with all natural, soy-based pigments. The card's graphic rendering is done using proprietary techniques which spray the pigments directly onto the seed paper, giving any chosen hue to the paper while ensuring there is no loss of seed integrity. 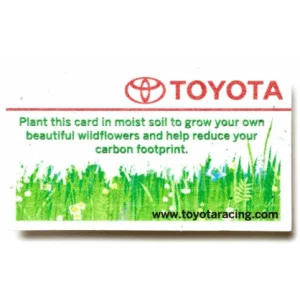 Seed Paper Business Cards are a great way to promote events, products and "going green" initiatives with an eco-friendly medium that will grow into a flourishing wildflower garden that gives life to your message. Seed Paper Business Cards are embedded with a wildflower seed mix. We have many seed type options available that can grow into flowers, vegetables, herbs, grasses, trees, and more. Your order can be further customized with a specialty Seed Mix, depending on your preference.